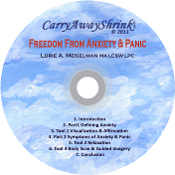 Shrink away your Anxiety! The timing could never be better then to start now! Start rearranging your mental imagery with Lorie, and learn how to turn off that chatty-trickster in your head and get cured from the nervous-willies. Lorie’s soothing voice will redirect your thoughts, guiding you through a new experience. It is easy to begin how to self-soothe and start relaxing. Listen, learn and relax... Through repeated listening you will gain the power to relax and rid yourself from anxiety. Listen prior to any anxiety provoking moments & Listen whenever you are feeling anxious.